Yesterday, as we were driving around Portage looking for something to eat, my brother mentioned that he really wanted to eat at someplace that they don’t have back home in Illinois. When he says that, he means a chain they don’t have back home, not a local mom and pop shop. Most of the chains along Westnedge he had eaten at before, so we ended up at Red Robin again. There isn’t one near him, his wife had never eaten at one, and he really liked it last time we were there. As we were driving back to US 131 last night after eating at Bilbo’s, we came across a Big Boy. 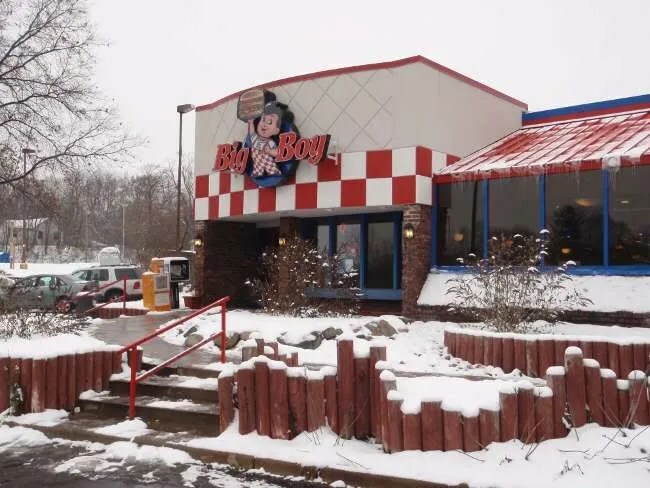 I never even gave Big Boy a thought, but it’s a restaurant I had never seen before moving to Michigan so I knew he hadn’t eaten at one before. We debated back and forth on lunch. Should we go out again? Should I just make something? J and I ate out quite a bit this weekend, so I was looking for a break, but with four people who all eat different things, eating out is just easier. 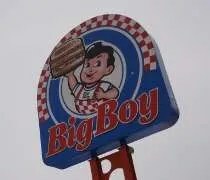 There are two Big Boy locations in Kalamazoo. We decided to order from the location in the Knollwood neighborhood on Stadium Drive at Drake Road. I say “ordered from” because we did carry-out. My niece was still sleeping when started talking about this and even though she woke up before we ordered, no one was in the mood for another sit down restaurant. This is by far one of the nicer exteriors I’ve seen at a Big Boy. I don’t have a lot of experience with the chain. We ate at the Okemos location before it shut down and we ate once at the Mason location. The thing that surprised me on our first visit to Big Boy was that it wasn’t fast food. That surprised my brother as well. He couldn’t figure out why we were phoning in an order. Like me, he always assumed it was a fast food place. He didn’t realize it was a sit down family restaurant until we walked in the door. The layout of the space isn’t much different from other Big Boy’s I’ve been to. There’s a small lunch counter with just a couple seats, a pie case, and a cashier right inside the door. The hostess station is right across from this space and the dining room is divided into two sections even though the restaurant is smoke free. The salad/breakfast bar is in the middle of the first dining room, but we were too late to take advantage of the cheap breakfast and not staying for the salad bar. The hostess noticed us waiting behind a guy who was having a hard time figuring out what he was doing at the cash register. She assumed we were sitting, but we told her we had a carry-out order. It was already bagged up and sitting in the order window. We could see it from the door. She grabbed the three bags, handed them to my brother, and handed me the check. After the guy in front of me got done, I handed the cashier the bill. Four meals cost us just $28. Yesterday, we paid that at two different places for just two meals. I was much happier today pay less than $15 for our meal. Both of the ladies ordered the grilled cheese sandwich. 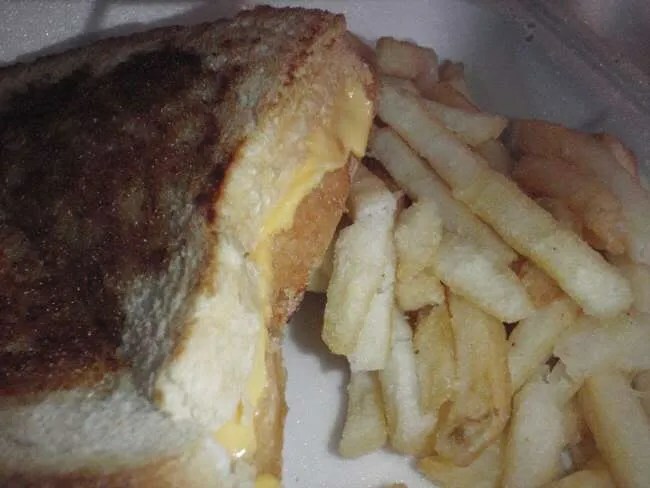 I have an old menu from Okemos and they had a triple-decker grilled cheese on the menu which is really what both of them wanted, but when J called, she was told they didn’t have that sandwich, so they both settled on a regular grilled cheese. They both got fries and neither of them said anything either way about their sandwiches. I ordered the Big Cheese & Bacon. The thing I like about Big Boy is the buns. It’s not quite a typical fast food/restaurant bun. 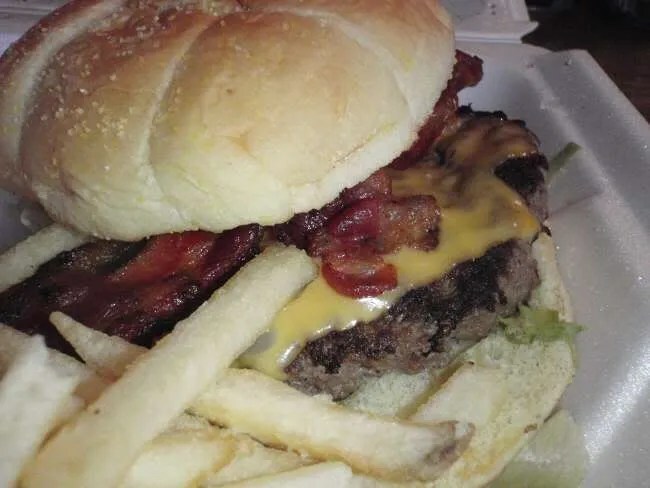 The meat is a typical frozen patty. Still, the sandwich was good and filling. It’s what I pretty much expect from a diner. The fries were a little cold, but that was probably more due to the carry-out than anything the restaurant did. My brother ordered The Big Boy. I told him that it was actually Big Boy that invented the Big Mac and not McDonald’s and he had to try it. 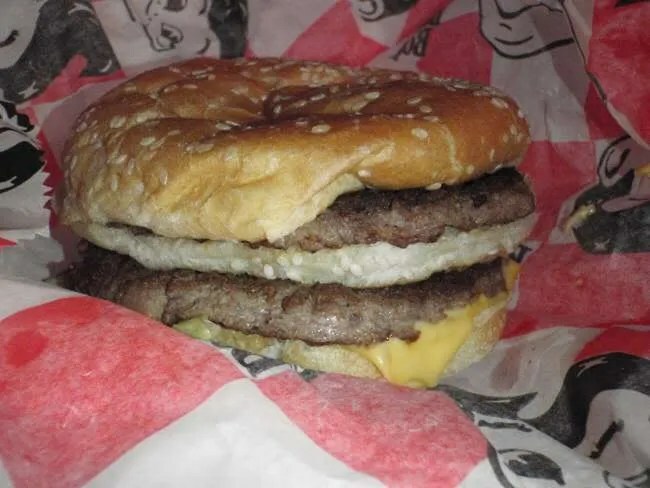 To me, it looked flat and didn’t have a lot of condiments, but he said it was very comparable to the Big Mac. He honestly said if he didn’t know any better, he probably wouldn’t have noticed a difference. All of our meals came with cole slaw, but no one touched it except J. None of us really like cole slaw. J said it was alright, but there was no way she was eating four servings of it. It was mayo based which isn’t her favorite either. Big Boy is what it is and that’s what I like about it. We got my brother to a place he had never been before and we got a good, cheap lunch after a couple of expensive ones yesterday.